You know those annoying, pestering people who have to share everything? Every great experience they ever had, they want you to have. They are constantly pressing books into your hands, making you stop to look at some stupid lake, insisting that you try a specific dish at a new restaurant, or listen to a song rightthisverysecond, or keep hounding you about a movie you absolutely have to see. Confession: I’m one of those people. So here’s a round-up of some of the things I needed to share. * My oldest boy, Nick, age 16, is a huge fan of The Office. We watched the wedding episode together last week. 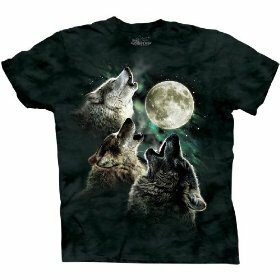 In it, Dwight wears his Three Wolf Moon T-shirt. The shirt has become a cultural phenomenon, so as a surprise I bought it for Nick. And for a brief few moments, I became the coolest dad on the block (it’s a short block). As I type this, the shirt is currently #2 in clothing sales on Amazon, with 1,508 mostly hysterical reviews. * At Children’s Book Day at Sunnyside, I sat next to author Charise Mericle Harper. She writes the Grace books. I got a really good feeling about her; she seemed real, not the least bit phony. I think we both have eight-year-old daughters. 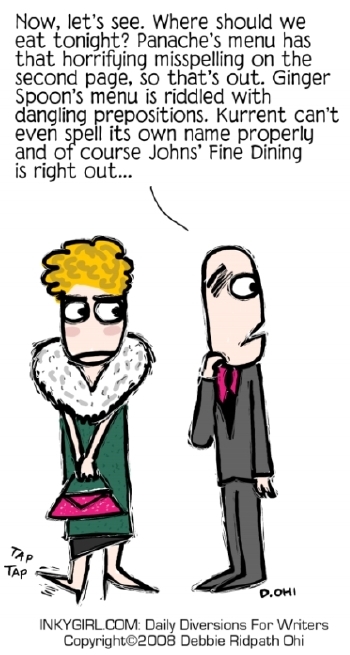 I’m charmed by her website (added to my blog roll), the creativity and humor. Her blend of hand-lettered text and illustration reminds me of Lynda Barry — and that’s a huge compliment. Anyway: Please read this about a bookstore signing gone bad, then good! It’s freakingfantastic. * I recently discovered the joys of Debbie Ridpath Ohi’s Inky Girl blog (aptly subtitled: “Daily Diversions for Writers”). For your convenience and mine, I’ve posted the link under “Random Pleasures” on my blog roll. Debbie does many things well, but one of my favorite features is her “Comics for Writers” series. * It takes a certain kind of typography nut/cheese freak to enjoy this site. Link sent to me by my old pal, Ellen Miles. * Imagine that you lived in a movie. 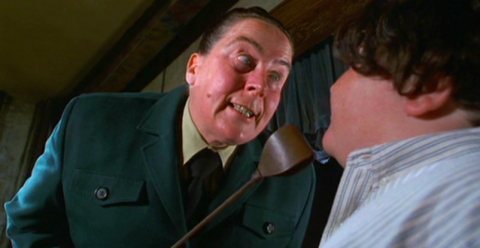 Who would be the most fearsome movie teacher of all? This site proposes 13 strong candidates. Can you think of any others? A couple of other easy picks would be “To Live Is To Fly” by Townes Van Zant, “Girl from the North Country” by Bob Dylan (which Liam Clancy performs beautifully, here — with such depth of emotion, regret, loss: I need you to hear it and love it rightthisverysecond ) . . . and, hey, wait a minute! You can’t trick me into this impossible task. My brain would explode. The bad signing turn good was great. I’ve heard good things about Just Grace, now I shall read one. Though I am sorry you have no stories of author’s smack downs verbal or otherwise to report from Children’s Book Day. I’m glad somebody is paying attention, Doret. True story: I saw Jean Craighead George — she rolled her terrible eyes, and gnashed her terrible teeth — and I knew I didn’t stand a chance. I tapped out before she got within five feet. Some of those others, maybe I could have taken. But she was way out of my league and remains The Champ.